One hundred years ago, the world was much different than it is today. The Temple Emmanuel church in Youngstown, Ohio, however, remains a constant force for good. The church was organized in 1917, first meeting in homes, later at a YMCA, then at a rented facility and finally in their own church building. The members of Temple Emmanuel enjoy a rich history of God’s faithfulness and blessings. To launch their 100th anniversary month, special guest speakers were scheduled each Sabbath in January, including William T. Cox Sr., Allegheny West Conference president, and former presidents James Lewis and Henry Wright, who concluded the series and commemorated this milestone. “One hundred years is something to be incredibly proud of,” preached Wright. Jorge Aguero, New Jersy Conference Personal Ministries director, recently wrote Acts of Compassion and Faith, a practical Bible study guide. It is specifically designed for small groups or family settings. Each chapter includes three sections: a specific Bible lesson, a discovery of Jesus’ teachings and a practical way to share His messages, love and compassion. The guides are available in English and Spanish. 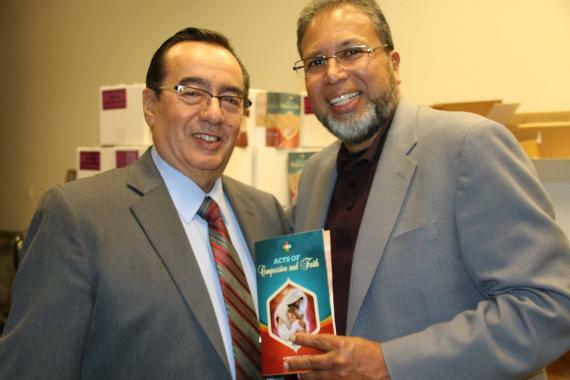 New Jersey Conference President, José H. Cortés, and Jorge Aguero, Personal Ministries director, celebrate the release of Aguero's Acts of Compassion and Faith Bible study guide. A group of college students meet twice a month at the University of Maryland (UMD) in College Park to study the Bible, share their faith and connect with Adventist students who may not have a home church. Adventist Student Fellowship (ASF) is a university- recognized Bible study group that holds a steady membership of more than 20 students. Members shine their lights on the secular campus by staying true to their convictions and sharing them with friends, classmates and professors. On Saturday, April 29, Kettering College will confer degrees and certificates on 200 students at the school’s 49th annual commencement ceremonies. The event will be held at the Dayton Convention Center. Dr. Jonathan Velasco, an alum of Kettering College and surgeon at Kettering Physician Network Surgery—Dayton Surgeons, will be the keynote speaker. This year will also commemorate Kettering College’s 50th anniversary. Washington Adventist University (WAU) is mourning the death of James William Burns III, an alumnus, former coach of the gymnastics team and head of Physical Education. He passed away last week on April 19 at the age of 84, surrounded by his family. He will long be remembered for his love of life and his positive attitude, as well as his penchant for doing handstands on the roof and his passion for running. Eight teams from the Columbia Union Conference placed first at the recent North American Division Pathfinder Bible Experience (PBE) in Chicago. Six teams placed second. To achieve first place, a team must score 90 percent of the top scoring team's score. Second place teams must earn 80 percent of the top scoring team's score.